The endothelium plays an important role in cardiovascular regulation, from blood flow to platelet aggregation, immune cell infiltration and demargination. Endothelium dysfunction inevitably leads to the onset and progression of cardiovascular disease (CVD). The aging endothelium displays significant changes in function, such as reduced vasomotor functions and reduced angiogenic capabilities. This may be partially due to increased levels of oxidative stress and reduced endothelial cell turnover. Endothelial Progenitor Cells (EPCs) are circulating angiogenic cells which play an important role in maintaining endothelial health and function. EPCs maintain endothelial health and function by supporting cell proliferation or by incorporation into vasculature and differentiation into mature endothelial cells. However, EPCs are reduced in number with age, and this reduction may also contribute to elevated CVD risk in aging populations. 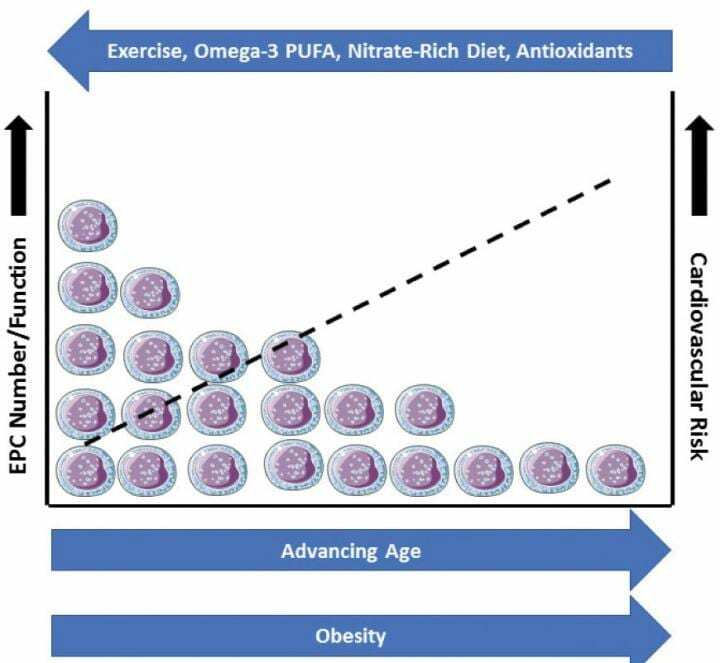 Lifestyle factors such as exercise, physical activity obesity, and dietary intake of omega-3 polyunsaturated fatty acids, nitrates, and antioxidants, greatly influences the number and function of these circulating angiogenic cells. This review presents information about the effects of advancing age on endothelial health and vascular regenerative capacity. It also covers the factors that can influence EPC functions which include the influence of diet, exercise, and obesity on these cells, the mechanistic links and the subsequent impact on the cardiovascular health. This is a useful guide for researchers studying the endothelial regenerative capacity and its relation with aging.